As web technology advances and enables brand owners to investigate the sale of counterfeit goods online more meticulously than ever before, how is the burgeoning market in anti-counterfeiting search services evolving? Brand valuation post-ISO 10668: from the jungle to the Garden of Eden? The new international standard on brand valuations has been viewed by some as bringing new clarity to a complex and fragmented industry. But will ISO 10668 really cut through the confusion surrounding brand valuation techniques? New Office for Harmonisation in the Internal Market (OHIM) President António Campinos has signalled his intention to embrace an enforcement role for the agency, promising to work with national offices to create a united front against counterfeiters. The British Brands Group and Institute of Trademark Attorneys (ITMA) have joined forces to voice serious concerns at the approach that the United Kingdom’s coalition government is taking to intellectual property, with trademarks often absent from political debate. The board of the Internet Corporation for Assigned Names and Numbers (ICANN) has resolved to meet with government representatives to clear up their remaining concerns over trademark protection in the proposed infinite generic top-level domain (gTLD) space. Albihns.Zacco AB has been expelled from the Association of Swedish Intellectual Property Law Firms (SEPAF) for breach of the organisation’s ethical rules. Time for a social network trademark dispute policy? Just when trademark lawyers thought that they had domain names under control, here come social network usernames. 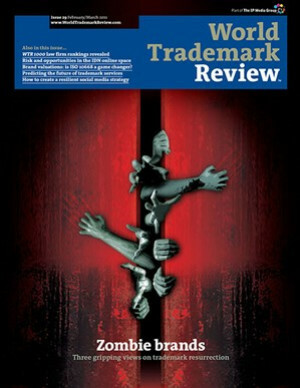 Is the trademark industry prepared? As the Internet becomes increasingly popular, online trademark infringement is becoming more common. As a result, traditional trademark protection methods have had to be adapted in order to take the unique characteristics of the online environment into consideration. The Internet provides new means for infringing registered rights. Such activities started with registration of domain names incorporating a trademark – widely known as cybersquatting (fortunately, there has been much progress in this field) and typosquatting – and evolving to trademark and copyright infringement through, among other things, keyword advertising, gripe sites and phishing scams. Companies are discovering that their trademarks are being used in ways that could not have been imagined a few years ago. For example, companies can purchase and use a competitor’s trademark as a ‘keyword’, and then use these keywords to trigger internet advertising for their own products and services. Since the early 1990s the Internet has become incredibly popular; according to Netcraft research, as of October 1 2010 there were more than 232 million active websites. It is impossible to imagine life without the unlimited opportunities that it offers. However, people use the Internet for many different purposes, some of which may be against the law. It is Saturday afternoon and Journey’s iconic song “Don’t Stop Believin’” is playing on a US college student’s computer. Next up on the playlist is something by Dave Matthews, followed by U2, Michael Jackson, The Rolling Stones and The Beatles: a well-thought-out playlist of tunes that have remained popular throughout the years. According to research recently published by Maria de las Heras on www.elpais.com, around 30 million people in Mexico use the Internet, with each person spending an average of three and a half hours a week connected to the Web. Considering that Mexico has a population of approximately 106 million, this means that about 28% of Mexicans use the Internet. The Google AdWords service and keywords in general are a current hot topic in the internet domain. For many years consumers have found the Internet to be the best marketplace for all kinds of goods and services. In particular, search engines help consumers to locate products from particular brands among all those available in cyberspace. For many businesses, a high ranking on internet search engine results is vital in directing internet users to their websites. Google’s AdWords programme has proved a valuable tool for many businesses in attracting internet users to their websites. However, as a significant proportion of internet searches are conducted against terms that are trademarks, Google elected to include trademarks within its AdWords programme, allowing anyone to bid for another party’s mark for use as an AdWord. Online advertising is a major industry. The Interactive Advertising Bureau of Canada reports that in 2009 Canadian online advertising revenues were C$1.82 billion, and forecasts that in 2010 revenues will rise to C$2.1 billion. In recent years the tension between online advertising and consumer privacy has given rise to several controversies.